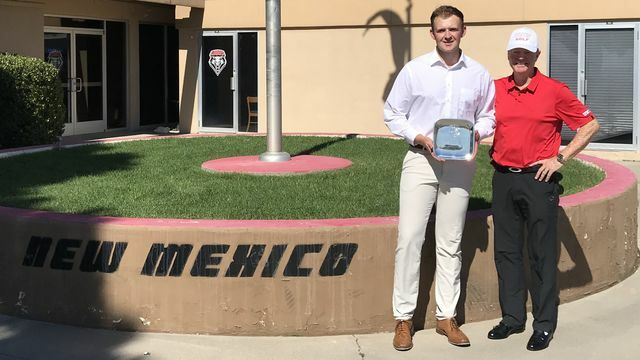 University of Nevada & Las Vegas Senior Harry Hall (West Cornwall) won his first individual collegiate title in the United States on Saturday when he triumphed over the University of New Mexico Golf Course, Alberquerque in the William H. Tucker Invitational. Hall is pictured above with UNLV men's Coach Dwaine Knight. Hall, now a Senior in his third year at UNLV, had 11 birdies en route to a 9-under-par 135 to take a two-shot lead through two rounds, in this the second of UNLV's collegiate events of the 2018-19 season. A third round 70 saw him tie for 1st place with Brigham Young's Peter Kuest on 205. The 5 man UNLV team finished in 2nd spot on a team total of 850 two shots behind Brigham Young (848). Hall's previous best finishes were ties for second at the 2017 National Invitational Tournament and the 2017 The Goodwin and a further second place at the 2018 Southern Highlands Collegiate. Well done 'H' - we are all very proud of you and are sure there will be many more to come!